Castellón is a city of moderate size ( approx. 178.000 inhabitants), which offers tourists a relaxed lifestyle, away from the hubbub of big cities, but at the same time it is modern and has a great offer of cultural and tourist activities. Take a walk through the historical city centre and get to know its busy streets and cosy corners. 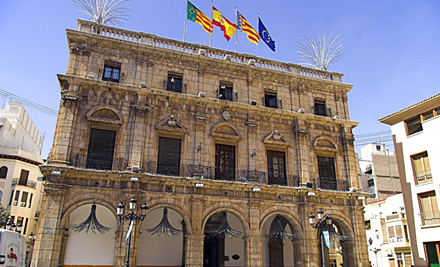 The main attractions of the city centre include the Main Square (Plaza Mayor), the City Hall (Ayuntamiento) dating back to the 17th century, the gothic procathedral of St. María from the 12th century, the bell-tower of the procathedral, known as El Fadrí, La Casa Abadía, the Library, the Market place, the Main Theatre, the bullfighting arena and various museums on top of that. To enjoy some nature and the beach, head to Grao and enjoy long walks or bike trips along the coastline, or visit the harbour and the planetarium. Castellón is a safe city to live in, so all our students who come to learn Spanish in Spain can move around easily. Castellón offers beaches to take a sunbath, do water sports or have a paella in one of the numerous restaurants at the beach front. In Spanish Institute, your Spanish school in Spain, we'll show your around the city and its surroundings to ensure that your stay in Castellón will be an unforgettable experience!